Functions associated with the mouse CEACAM1 proteins: Our laboratory has been characterizing the functions of cell surface receptor proteins named CEACAM1 for carcinoembryonic antigen-cell adhesion molecules. In addition to their role as intercellular adhesion molecules, these proteins also function as negative immune regulators in T and B lymphocytes as well as NK cells, platelets and neutrophils. In addition, these cell surface glycoproteins function as receptors for mouse hepatitis viruses and the human CEACAM1 is the receptor for Neisseria bacteria. Our goal is to understand how CEACAM1 transmits negative regulatory signals to different cell types and the mechanisms by which these proteins perform their function. We are consistently using molecular and cell biology approaches, as well as in vivo genetic manipulation to produce either Ceacam1 gene knockout mice or transgenic mice overexpressing either wild-type or mutant versions of the protein. We are currently involved in the characterization of the associated phenotypes in these animals to understand the functions in an in vivo setting. Role of CEACAM1 proteins in tumor formation and progression: We have shown that CEACAM1 proteins, normally expressed in epithelial cells, are down-regulated early in the process of epithelial tumor development. By reintroducing the proteins in colon tumor cells having lost their expression, we have shown that these cells no longer behave like tumor cells. The downregulation of CEACAM1 protein expression is one of the major genetic changes associated with colon, liver, endometrial, prostate and breast cancers. We have shown that maintenance of the negative proliferation signals in colonic cells depends on the tyrosine phosphorylation of the cytoplasmic domain of CEACAM1 and its association to the tyrosine phosphatase SHP-1. On the other hand, CEACAM1 expression is upregulated in angiogenic situations. We are currently assessing how the up-regulation of CEACAM1 expression in endothelial cells results in tumor progression in the later phases of cancer development. We are also deciphering the role of the CEACAM1 protein in colon cancer metastasis using in vivo models. Our focus is to understand the mechanisms responsible for the modulation of the CEACAM1 expression and how this can translate into more effective therapies for cancer patients. Liver metastasis is the predominant cause of colorectal cancer (CRC)-related mortality in developed countries. CEACAM1 is a cell adhesion molecule with reduced expression in early phases of CRC development and thus functions as a tumor growth inhibitor. However, CEACAM1 is up-regulated in metastatic colon cancer, suggesting a bimodal role in CRC progression. To investigate the role of this protein in the host metastatic environment, Ceacam1-/- mice were injected intrasplenically with metastatic MC38 mouse CRC cells. A significant reduction in metastatic burden was observed in Ceacam1-/- compared to wild-type livers. Intravital microscopy showed decreased early survival of MC38 cells in Ceacam1-/- endothelial environment. Metastatic cell proliferation within the Ceacam1-/- livers was also diminished. Bone Marrow-Derived Cell recruitment, attenuation of immune infiltrates and diminished CCL2, CCL3 and CCL5 chemokine production participated in the reduced Ceacam1-/- metastatic phenotype. Transplantations of wild-type bone marrow into Ceacam1-/- mice fully rescued metastatic development, whereas Ceacam1-/- bone marrow transfer into wild-type mice showed reduced metastatic burden. 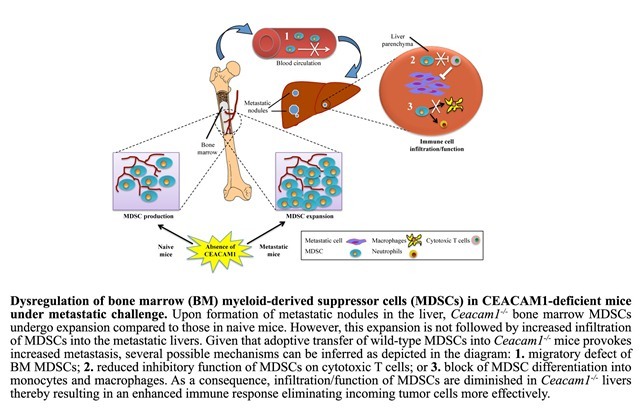 Chimeric immune cell profiling revealed diminished recruitment of CD11b+Gr1+ myeloid-derived suppressor cells to Ceacam1-/- metastatic livers and adoptive transfer of myeloid-derived suppressor cells confirmed the involvement of these immune cells in reduction of liver metastasis. CEACAM1 may represent a novel metastatic CRC target for treatment. E. Xu*, A. Charbonneau, Y. Rolland, K. Bellmann, K. Siminovitch, B.G. Neel, N. Beauchemin and A. Marette. Hepatocyte-specific SHP-1 disruption uncouples liver insulin resistance from hepatic steatosis and inflammation in diet-induced obesity. Diabetes. 61(8):1949-58 (2012). Azadeh Arabzadeh and Nicole Beauchemin. Stromal CEACAM1 expression regulates colorectal cancer metastasis. OncoImmunol. 1(7):1205-1207 (2012). L. Chen, Z. Chen, K. Baker, E. M. Halvorsen, M. B. Flak, G. Gerber, Y.-H. Huang, J. C. Arthur, K. J. Dery, T. Nagaishi, N. Beauchemin, K. V. Holmes, J. E. Shively, C. Jobin, A. B Onderdonk, L. Bry, D. E. Higgins, R. S. Blumberg. Secretory immunity and pathogen resistance are mediated by CEACAM1-short isoforms in intestinal T cells. Immunity, 37(5):930-46 (2012). I.-K. Na, S.X. Lu, N. Yim, G. L. Goldberg, J. Tsai, U. Rao, O. M. Smith, C.G. King, D. Suh, D. Hirschhorn-Cymerman, L. Palomba, O. Penack, A.M. Holland, R.R. Jenq, A. Ghosh, H. Tran, T. Merghoub, C. Liu, G. Sempowski, M. Ventevoge, N. Beauchemin, B. Furie, and M.R.M. van den Brink. The Cytolytic Molecules Fas ligand and TRAIL are required for thymic Graft-versus-Host-Disease. J. Clin. Investig. 120(1):343-56. (2010). C. Meunier*, J. Cai, A. Fortin, T. Kwan, J. F. Marquis, C. Turbide, L. Van Der Kraak, S. Jothy, N. Beauchemin and P. Gros Characterization of a major colon cancer susceptibility locus (Ccs3) on mouse chromosome 3. Oncogene, 29(5):647-61 (2010). E. M. Xu1, *N. Leung1, MJ. Dubois, A. Charbonneau, T. Streichert, M. Elcheby, C. Turbide, E. Lévy, N. Beauchemin# and André Marette#. Targeted disruption of Ceacam1 promotes diet-induced hepatic steatosis and insulin resistance. Endocrinology 150, 3503-3512 (2009). 1co-first authors, # co-last authors. Horst*, T. Bickert, N., Brewig, U. Schumacher, N. Beauchemin, B., Fleischer, C. Wagener and U. Ritter. CEACAM1 expression on macrophage precursors affects early lymphangiogenesis in vivo. Blood 113(26), 6726-6736 (2009). C. Wong, Y. Liu, J. Yip, R. Chand, J.L. Wee, L. Oates, B. Nieswandt, A. Reheman, H. Ni, N. Beauchemin, D.E. Jackson. CEACAM1 negatively regulates platelet-collagen interactions and thrombus growth in vitro and in vivo. Blood, 113(8), 1818-28 (2009). N. Leung*, C. Turbide, B. Balachandra, V. Marcus and N. Beauchemin. Intestinal tumor progression is promoted by decreased apoptosis and dysregulated Wnt signaling in Ceacam1-/- mice. Oncogene, 27(36), 4943-53 (2008). M.J. Dubois, S. Bergeron, H.J. Kim, S. K. Dombrowski, M. Perreault, B., Fournès, R. Faure, M. Olivier, N. Beauchemin, G. I. Schulman, K.A. Siminovitch, J.K. Kim and A. Marette. The SHP-1 protein tyrosine phosphatase negatively modulates glucose homeostasis. Nat. Med. 12(5), 549-56. (2006) Funded by CIHR 13111. A.K. Horst*, W.D. Ito*, J. Dabelstein, U. Schumacher, H. Sander, C. Turbide, J. Brummer, T. Meinertz, N. Beauchemin* and C. Wagener*. CEACAM1 modulates vascular remodeling in vitro and in vivo. J. Clin. Investig. 116(6), 1596-1605, (2006). Funded by CRS. *contributed equally to the work. S.M. Najjar, Y. Yang, M.A. Fernstrom, G.A. Abou-Rjaily, A.M. DeAngelis, Q.Y Al-Share, T. A. Miller, T. Dai, S. Ratnam, R.J. Ruch, S. Smith, S.H. Lin, N. Beauchemin and A.M. Oyarce. Insulin Acutely Decreases Hepatic Fatty Acid Synthase Activity. Cell Metabolism 2, 43-53 (2005). Funded by CIHR 13111. A. Arabzadeh and N. Beauchemin. Cell Adhesion Molecules in Colon Cancer Metastasis. Metastasis of Colon Cancer. Springer eBook. Editors: J. Huot and N. Beauchemin in press (2010). A.-L. Nouvion et N. Beauchemin. CEACAM1: Modulateur central du métabolisme, de la progression tumorale, de l’angiogénèse et de l’immunité., Médecine Sciences. Mar;25(3):247-252 (2009). N. Beauchemin. CEA Gene Family and Cancer. Cancer Encyclopedia 2008.